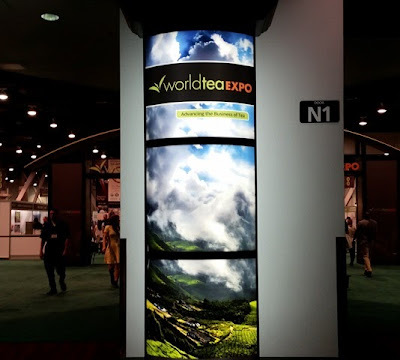 Day Two at the World Tea Expo was spent almost exclusively in the Exhibit Hall. The morning kicked off at the Sara's Tea Caddie booth where Sara Kadowaki lead a tasting of teas from all over Japan. 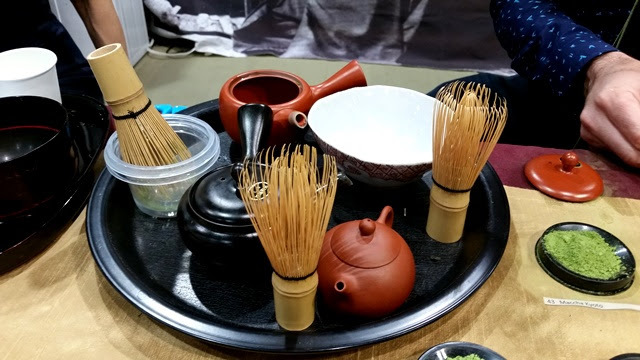 While I was there we tasted Tenryu Sencha Special, Fukuoka Zairai (cultivated from seed from 100 year old bushes), Sakimidori Sencha, Organic Oolong Black Tea, Kabusecha (shaded for 2 weeks in Mie), and Gyokuro Goko (shaded 16 days in Yame). During the tasting, I learned that high-grade shaded teas will be shaded with natural materials while lower grade teas are shaded with synthetic materials. Chazen founder Rie Takeda is a Japanese Tea Association Instructor and holds the title of Associate Professor with the Urasenke school. She offers a variety of tea ceremony experiences and workshops at Chazen tea room in Ginza, Tokyo (next to Kabuki-za). This year she unveiled a matcha gift set, a decorative mailer the size of a greeting card containing a single portion of matcha, a fold-out whisk, and instructions for preparing the matcha. It's a clever gift idea for tea loving friends and family and it's ready to mail with no additional packaging. Look for a review in a future post. 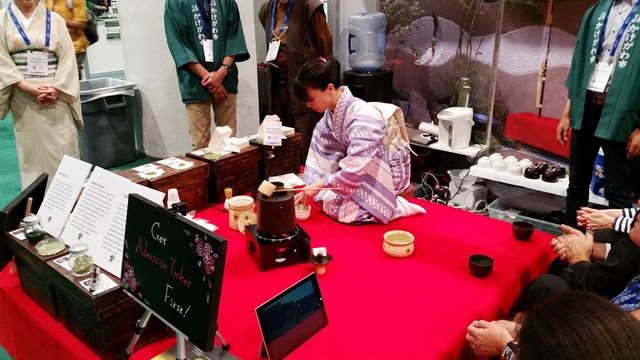 While visiting the Chazen booth, I had the opportunity to pause for a moment of peace to enjoy tea prepared by Takeda-san. Please enjoy this beautiful promotional video for Chazen. 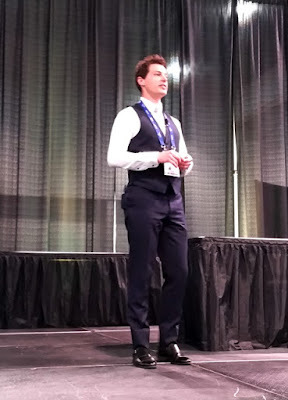 Nihoncha Instructor Oscar Brekell, in association with the Japan Tea Export Council (JTEC) and hosted by JETRO, made an informative presentation on Japanese teas on the Special Events Stage. Notably, Oscar holds the distinction of being the only foreigner certified to make hand-made sencha. Japan's main growing regions are Aichi, Fukuoka, Kagoshima, Kumamoto, Kyoto (Uji), Mie, Miyazaki (Saga), Nagasaki (Gifu), Nara (Shiga), Saitama, and Shizuoka. We learned about several Japanese tea cultivars and their characteristics. Among them, Yabukita is the dominant cultivar in Japan because it's easy to produce and provides a good yield of high-quality tea. Production of single-origin and zairai (native) teas propagated from seeds has increased over the past ten years. 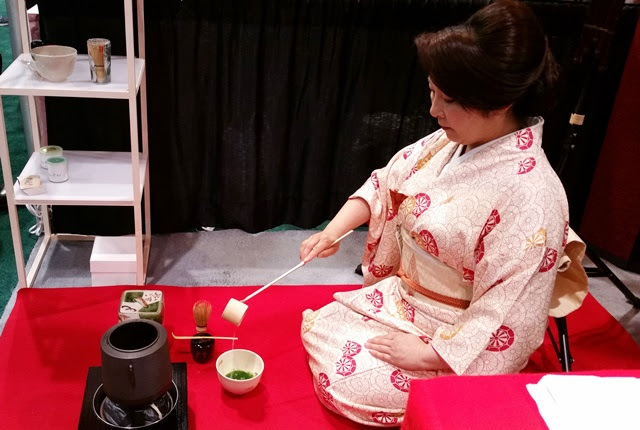 Japan exported a lot of tea to the U.S. as far back as 150 years ago and hybrids of assamica and sinensis in Japan are the results of attempts to produce black teas to appeal to the U.S. market. Most tea in Japan is a blend from many farms. Tea farmers produce aracha (crude tea) and sell this to wholesalers who will blend, store, and refine the tea (firing and sorting), then distribute it to retailers. The general term for refined tea is shiagecha. It's worth noting that aracha has a high moisture content (~5%) so it is not good for storage. You also can't taste the uniqueness of the cultivar in aracha that you can taste in shiagecha. Catechins dissolve easily in hot water resulting in a bitter or astringent taste while amino acids dissolve easily in lukewarm and cold water resulting in a sweet taste. When serving Japanese teas pour a little into each cup, making as many passes as necessary to empty the teapot. By this process called mawashitsugi, the tea will have even strength and color in each cup. Taking the lid off after pouring allows the heat to escape, resulting in a tastier second infusion. Oscar recommends boiling water to soften it before using it for cold-brew (mizudashi) tea. During this presentation we were served a cold-infused single-origin gyokuro (Amakai cultivar) and Koshun-cultivar tea made using local water. The ITI booth held a talk and tasting with Hidenori Moriguchi (MîTÉ Co., Ltd.), Bhavin Shah, and James Norwood Pratt. 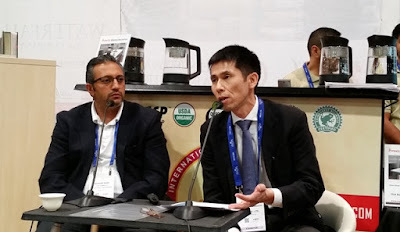 MîTÉ is the global distributor for Ise-cha, the branded name for teas produced in Mie Prefecture which was once known as Ise Province. Mie is the third highest producer of tea in Japan, specifically aracha (unrefined tea). They produce tencha, but not matcha, as well as a significant amount of fukamushicha (deep-steamed sencha). During the talk, we tasted sencha, fukamushi sencha, and organic kabusecha. Zealong produces single-origin teas from a Taiwanese cultivar, grown and processed in the Waikato region of New Zealand. Nepal Tea LLC is celebrating a successful Kickstarter campaign. 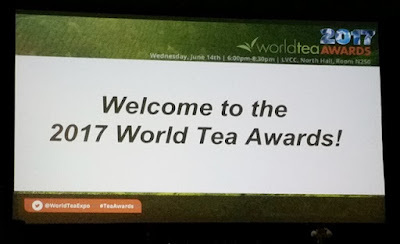 I've had the pleasure of reviewing several of their teas and it was great being able to speak with founder Nishchal Banskota again. JusTea directly sources fair-trade teas like the Kenyan Purple Leaf Tea produced by Tumoi Teas. 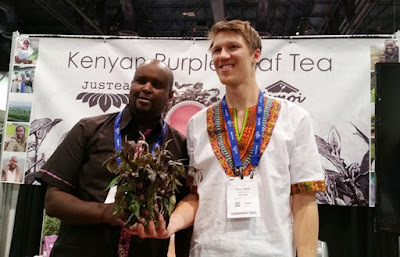 This was a rare opportunity to meet Tumoi Teas farmers Boaz and Jamilla. Tea Spot introduced their Mountain Tumbler featuring double-walled stainless steel and a removable stainless steel filter. Since it's lightweight, insulated, and handles hot and cold beverages, it may be just what I need to reduce my collection of tumblers and bottles. Silk Road Teas specializes in sourcing rare and artisan Chinese teas, including "fresh" teas produced in spring by local custom and to local preference. 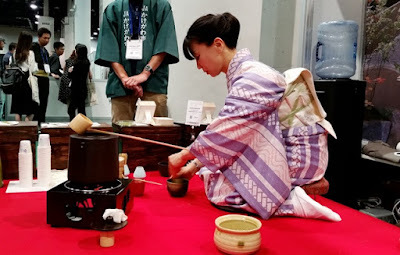 I've had the opportunity to sit in on a couple of their tea tastings at the Northwest Tea Festival and it was great to see them at the Expo. Yoshimura Package Partners introduced Kawaii Ziplock Bags featuring decorative washi exteriors. Bitaco teas are grown and harvested in the Andes Mountains of Colombia at elevations between 1,700 and 2,000 feet. I had the opportunity to review some of their teas a few years ago and it's great to see how much they've grown and made refinements to bring out the unique characteristics of their terroir. Teas Unique sells teas from several famous growing regions in Korea. 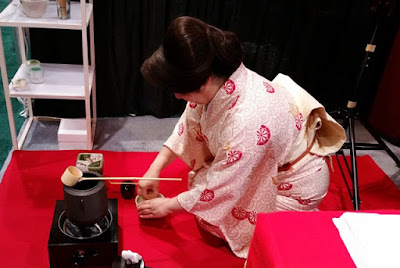 I've had the opportunity to review a few of their teas and I was happy to finally to meet them at the Expo this year. Kanei Hitokoto Seicha has been producing tea in Shimada, Shizuoka since 1865. 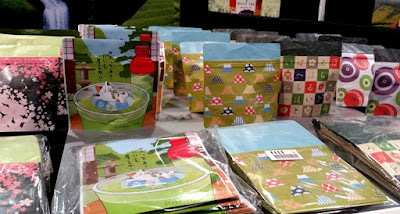 They have a a store in Shimada near the Ocha no Sato (World Tea Museum) and their products are sold in other retail locations. Dobashien is the overseas distributor for JA Kakegawa and they had a joint exhibit this year. I was honored to enjoy tea prepared by Tea Instructor, Akiko Dobashi. Kagoshima Seicha has been in business since 1881. Their retail tea business, Birouen Tea, was established in 1883 and Kagoshima Seicha Co., Ltd. was established in 1947 to handle the wholesale side of business. 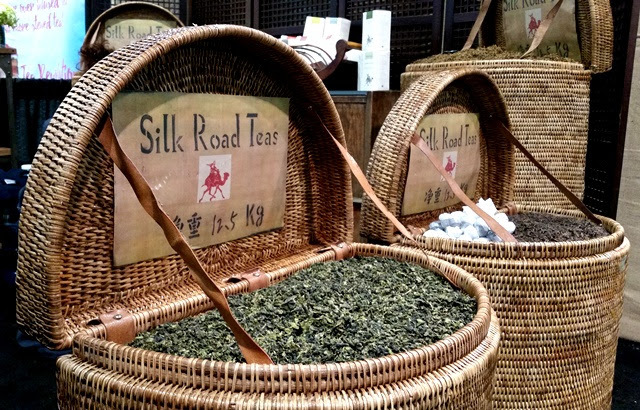 In addition to a visit to their tea shop, they also offer factory and tea field tours. Nanami Tea has been producing tea in Uji since 1859 and currently produces single-origin USDA organic green teas. 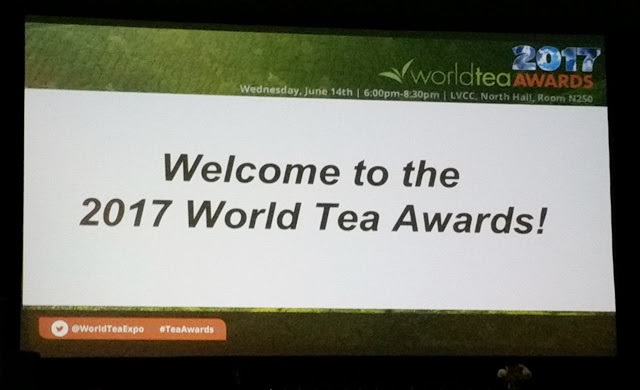 Bruce Richardson and Kevin Gascoyne co-hosted the 2017 World Tea Awards. In addition to the award recipients, we joined Sri Lanka in celebrating the 150th anniversary of Ceylon Tea and the Sri Lanka Tea Board. 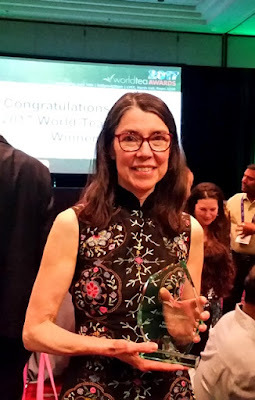 I was seated next to Linda Gaylard who won Best Tea Publication for The TEA Book and seeing her light up with surprise and joy at the announcement was priceless. 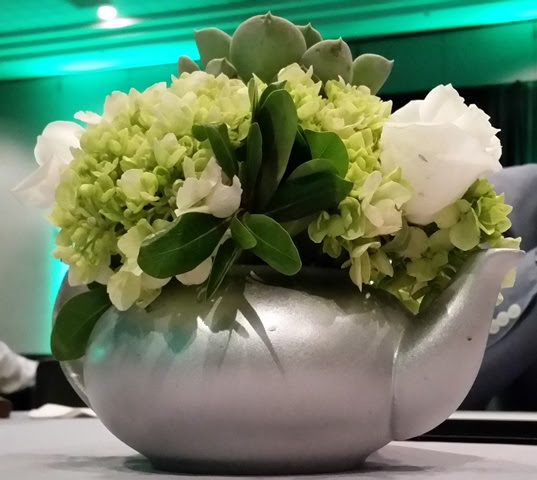 Honorable mention goes to our table's lovely teapot floral centerpiece. Visit World Tea News for a complete list of 2017 World Tea Award winners.